The Walter Scott Digital Archive aims to be the go-to website for anyone seeking authoritative information on Scott’s life and work. It is designed around Edinburgh University Library’s Corson Collection, the world’s largest self-standing collection of Scott materials. The Collection is the lifework of James C. Corson (1905-88), Deputy Librarian of Edinburgh University (1939-65) and Honorary Librarian of Abbotsford (1953-88). Best-known for his Bibliography of Sir Walter Scott (1943) and Notes and Index to Sir Herbert Grierson’s Edition of the Letters of Sir Walter Scott (1979), Corson’s greatest legacy is an archive of almost 7,000 printed books, over 10,000 artworks, and an extraordinary range of memorabilia, that he accumulated from childhood onwards (keeping an accessions register from the age of twelve!). The site features pages on all of Scott’s novels, poems, and major prose works, illustrated by artworks from the Corson Collection. For each work, there is bibliographical information on the first edition, a brief compositional history (drawing on the Edinburgh Edition of the Waverley Novels), a synopsis, and details of its original reception by public and critics. There are links to e-texts, recent critical articles, and other online resources. These include synopses and reader’s guides, links to musical or theatrical adaptations, images of associated artworks, and pages devoted to people and places thought to have inspired Scott. Scott’s unparalleled popular impact is also marked by links to places, plants, and animals named after Scott characters (the many U.S. settlements named Waverly or Waverley; Robsart, an Australian ghost town aptly named after the doomed heroine of Kenilworth; the ‘Jeanie Deans’ rose; the ‘Dandie Dinmont’ terrier). The ‘Biography’ section has illustrated pages on Scott’s family, childhood, education, legal career, marriage, and his most important relationships. It traces his career from his debut as a translator of Goethe and Bürger (with images of rare editions in the Corson Collection) through to the ‘Magnum Opus’ edition of the Waverley Novels. It offers more detailed examinations of key moments in Scott’s life, such as the financial crisis of 1825-26 which brought him to the edge of bankruptcy. There is space too for less well-known episodes, such as Scott’s relations with the deeply eccentric Gallowegian poet, painter, and landscape surveyor, John Morrison (1782-1853), which resulted in one of the treasures of the Corson Collection: a manuscript map of the Abbotsford estate, with the names of fields and plantations in Scott’s own hand (reproduced on the website). Besides providing reliable bio-bibliographical information, the Digital Archive serves as a newsletter for Scott events and publications. A constantly updated ‘Forthcoming Events’ page lists conferences, exhibitions, papers, lectures, and talks. It is linked to an archive which now lists over three hundred Scott-related events from the last decade. The ‘Recent Publications’ section records works published since the year 2000, including significant new editions of Scott’s work, criticism, biography, and translations into languages as diverse as Albanian, Moldovan, and Vietnamese. ‘Criticism and Biography’ provides an analytical guide to over fifty recent books on Scott and over 1,100 critical articles or book-chapters wholly or substantially devoted to Scott, bearing eloquent witness to the dramatic upturn in Scott’s critical fortunes. These can be searched by author, work(s) discussed, topic, or year of publication. This section modelled on Corson’s own Bibliography of Sir Walter Scott and the sequels compiled by the late Jill Rubenstein covering the period 1940-90.1 We have therefore attempted, time and resources permitting, to include a brief abstract for each entry. In due course, we hope to cover the period 1990-2000, closing the gap between Jill Rubenstein’s bibliographies and our own. The Digital Archive is also a general web portal for Scott, linking to e-texts of his works, and highlighting other online resources. The site publishes a number of major e-texts itself, including a critical edition of one of Scott’s first published works, the ballad anthology An Apology for Tales of Terror (1799), prepared by Douglass H. Thomson of Georgia Southern University. Thanks to the generosity of the great Japanese Scotticist Takero Sato, we also offer e-texts of H. J. C. Grierson’s edition of the Letters of Sir Walter Scott (Constable, 1932-37) and of Tales of a Grandfather. These are PDF files that Professor Sato prepared as private reference material for his own research and which, on retirement, he felt would benefit the scholarly community. We also link to over three hundred e-texts provided by external sites and provide an index to the many shorter poems by Scott available in online anthologies. Our ‘Untangling the Web’ pages provide a path through over two hundred other sites of Scott interest. These begin with Scott-related projects and organisations, biographical and bibliographical resources, and major library collections or archives of Scott materials. There are links to pages on people and places associated with Scott. The former include friends, peers, influences, imitators, and prototypes of his characters. Places, conversely, range from Scott’s own homes and haunts, through monuments and museums, locations featured in his works, and towns and buildings with Scott-inspired names, through to follies like ‘Singer Castle’ in St. Lawrence County, New York, inspired by Scott’s description of Woodstock Palace. Finally, ‘Miscellaneous Links’ include literary or creative works about Scott such as an imaginary letter to Scott written by Pope John Paul I, overviews of Scott in theatre and film, and pages on subjects as diverse as cooking tips derived from Scott and phrases coined by Scott (from ‘caught red-handed’ to ‘tongue in cheek’). All pages on the Digital Archive are illustrated with images from the books, artworks and objects in the Corson Collection. The artworks are also the focus of an Image Database which permits users to view and work dynamically with over one thousand high resolution digital reproductions of Scott-inspired paintings, drawings, engravings, and lithographs by major artists such as William Allan, George Cruickshank, and J. M. W. Turner. 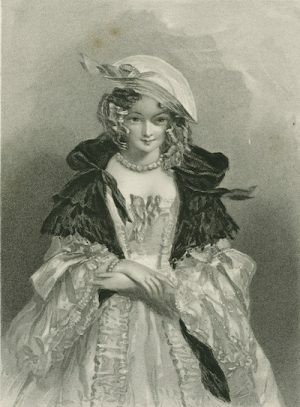 To take the example of Waverley itself, in this its bicentenary year, the Image Database includes engravings of episodes from the novel, of Rose Bradwardine and Flora MacIvor (extracted from the many popular ‘Portrait Galleries’ of Scott heroines), of Scott’s historical prototypes (Charles Edward Stuart and MacDonald of Glengarry), of buildings and landscapes featured in the novel (Carlisle, Edinburgh, and Stirling Castles), and of buildings which may have inspired Scott’s creation of Tully-Veolan (Craighall Castle and Traquair House). The Image Database also contains playbills, literary manuscripts, letters, and Scott memorabilia ranging from cigarette cards and cufflinks to thermometers and bed-warming pans. Images from the site have not only been used for teaching and research purposes, but have featured in books, journals, TV programmes, exhibitions, art festival programmes and others websites. Requests have ranged from finding suitable images for Edinburgh’s successful bid to become UNESCO City of Literature to decking out an Ivanhoe-themed room on a cruise liner. The Walter Scot Digital Archive aims to be both the online base for Scott studies and a wide-ranging information source for anyone with an interest in Scott and his lasting impact on both Scottish and global culture. For more information, contact Paul Barnaby: paul.barnaby@ed.ac.uk. Jill Rubenstein, Sir Walter Scott: A Reference Guide (Boston: G. K. Hall, 1978) and Sir Walter Scott: An Annotated Bibliography of Scholarship and Criticism, 1975-1990 (Aberdeen: Association for Scottish Literary Studies, 1994).